The group of men make it round the trail with no problem, however the same cannot be said of the five women who set off on that fateful Thursday afternoon, backpacks fully stocked with boil-in-the-bag meals and supplies to see them through their journey through the harsh terrain. However disaster strikes for the girls when a series of events leads them to go horribly wrong with their trail. They quickly become disorientated and conditions go against them. It's not long before fear sets in and the girls start to panic, which eventually results in one of the most out-spoken members of the team, Alice, going off on her own. The remaining four manage to make their way back to the starting point, expecting Alice to be there waiting for them. Except she isn't. No one knows what's happened to her, and as time goes on a full-scale search begins to find her whereabouts amongst the Giralang Ranges. Federal Police Agent Aaron Falk's attention is immediately drawn to the case - not just because there is a missing person but because of who that missing person is. Alice Russell had been secretly working alongside Falk in a bid to uncover fraud taking place within BaileyTennants. Falk can't help but wonder if her sudden disappearance is something to do with their investigations. The historical murders of three women in this area of the outback by the notorious Martin Kovac are also playing on his mind. And whilst Kovac eventually died in prison - who knows what secrets are hidden in Mirror Falls? First thing's first: confession time. 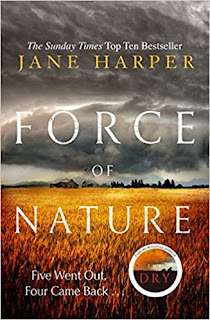 I must be one of the only people in the world who hasn’t read Jane Harper's critically acclaimed debut, The Dry. I have heard so many amazing things about this novel but just haven't got round to reading it. 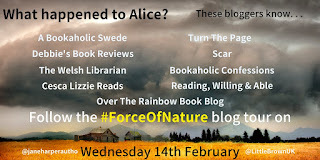 Therefore, when the lovely team at Little, Brown offered me the opportunity to be on the blog tour for Jane's follow-on novel, Force of Nature, I had high hopes and was also really looking forward to discovering Jane's writing, at last. I had a sense that I might enjoy this novel, the storyline sounds fantastic and who wouldn't be intrigued by that tagline? But OH MY GOSH. I had no idea just how much I would love this story and allow it to take over my life to the extent that it did. I seemed to develop some medically recognised condition whilst reading this novel where I actually lost the ability to put it down. I thought about this novel all the time when I wasn't reading it and I counted down until my breaks at work just so that I could fit in a few more pages. I would read it at every opportunity- including whilst drying my hair and waiting for the kettle to boil (that's multitasking.) It really was that good. 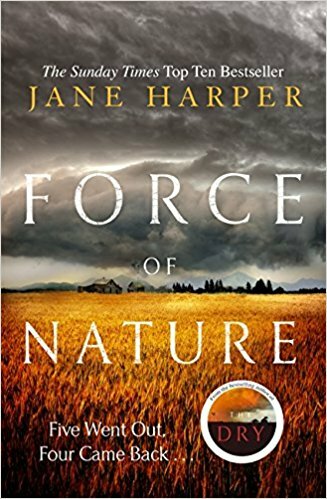 The way that Jane Harper formulates suspense into the story is done incredibly well. There are so many red herrings along the way and this element just kept reeling me in. I had suspicions about what was happening but they were often incorrect and I was just desperate to find out what had really happened to Alice out there in the outback. And as for that setting - don't even get me started! I had no trouble picturing the Giralang Ranges in my head, the sparseness, the way in which every corner and turn looks identical to the last. It really spooked me. I felt the fear, panic and hopelessness that Alice, Lauren, Bree, Beth and Jill experienced when they got lost. I was scared...scared both for them and of the unknown. Jane's writing just sets the scene so very well and her descriptions are amazing. The whole novel had such an atmospheric feel to it. I also loved how the chapters alternated between the present day investigations and the events that unfolded between the girls and their struggle for survival. This was done is such a clever way so that you gradually gain enough knowledge to start forming your own ideas on what was going on. The character dynamics were also another thing I loved about this novel. Each of the five women were so perfectly formed and brought to life exceptionally well. They all had such complex relationships with one another (I was particularly fascinated by the one between Bree and Beth.) I also really enjoyed reading about Carmen and Falk's working relationship. They really bounced off one another and made a great team. A huge thank you to Kimberley at Little, Brown for the opportunity to review.